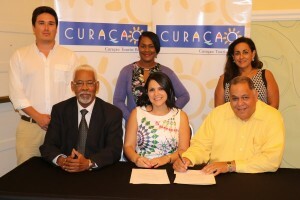 WILLEMSTAD – Recently, the Curaçao Tourist Board signed a Letter of Intent (LOI) with Latin Interactive Group, SABRE’s official representative in the Caribbean. SABRE is a global distribution system, used by travel agents around the world which contains airlines, hotels, cruise lines and car rental brands information. SABRE enables users to search for the best price and the possibility to book a ticket. The LOI entails to explore the possibility to install on curacao.com a booking engine that will provide small hotels and apartments or other tourism related companies the opportunity to sell their rooms or product online. Minister of Economic Development, Mr. Errol Goeloe was also present at the signing of the LOI.